You must be a member of the Dallas Singles Group to attend this activity. Would you like to join this group? I have my house now on Lake Tawakone. We will get to the land at noon on Saturday. we will setup, hang out on the beach or in the hammocks. We will then build a bonfire for the evening. 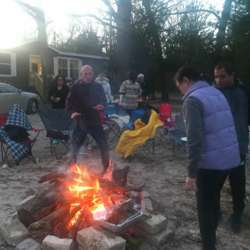 in the evening we will hang out by the bonfire and cook and eat our dinner. Most people would sleep in their tents, a few can sleep in the house, please arrange that with me separately.